Dubai, June 2nd, 2014: The Vienna Tourist Board will offer visitors of the Marina Mall in Abu Dhabi on June 6th and 7th and visitors at the Dubai Festival City on June 20th and 21st, a unique opportunity to not just see, but also ‘experience’ the Austrian Capital in all its natural beauty. A part of one of Vienna city’s most renowned parks, the “Volksgarten”, will be recreated in these two places on an area of more than 100 square meters. The recreated park would have a LED screen enthralling the visitors at the venue to experience the ambience and take pictures of the green surroundings of the Viennese Volksgarten Park. Vienna is also one of the most favoured holiday destinations for visitors from the Middle East. The number of tourists to the Austrian capital has seen a surge of 70,000, an increase of over 14 per cent from last year. “Vienna is famous for its parks and gardens that lend to the relaxed atmosphere in the city. The recreated parks in Dubai and Abu Dhabi will also bring to life, with the help of a huge screen, everyday scenes from Volksgarten. 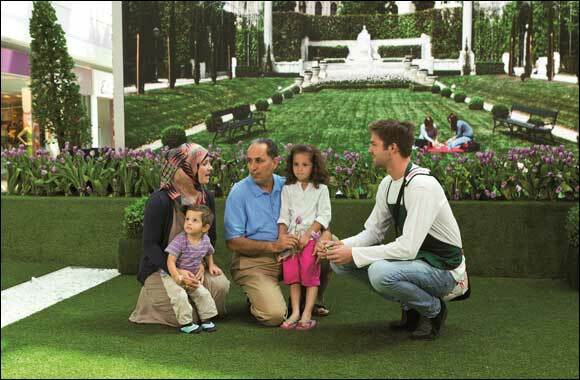 Mall visitors will get to see scenes of Vienna where morning joggers rush through the park and business men have coffee on a park bench, while in the afternoon people read the newspapers and children play in the meadows, until in the evening street lamps cover the park in a serene light and couples peacefully stroll between the flowers, which add to the ‘realistic feel’ of the indoor park,” said Klaus Ehrenbrandtner, Regional Director for Asia & Middle East, Austrian National Tourist Office. The rise of temperatures during the summer months see many residents of the UAE plan their upcoming holidays to cooler locales. Europe, with its mild weather, fresh air and scenic locations, is still favoured as one of the most popular destinations for holiday makers from the Middle East. The Austrian capital is known as a “green” city with more than 50% of the metropolitan area comprising gardens, parks and woods. The biggest among these parks is the Prater Park which is twice as large as the Central Park in New York. The Volksgarten, popular among the city residents, is located in the city center and situated close to the Imperial Place has more than 400 varieties of roses. With around 50 percent of the city accounted for by green spaces, Vienna is one of the world’s greenest major capitals. The supply of fresh drinking water to the city in Vienna is supplied by 30 mountain springs, carried to the capital from the Lower Austrian and Styrian Limestone Alps by two pipelines measuring 150 and 180 kilometers. “In May and June 2014, UAE tour operator DNATA will offer special package deals to Vienna for a 3 nights/4 days stay in selected 4 star and 5 star hotels starting from AED 3,335 net per person in a 4 star hotel including the air fare. These packages are promoted at special promotion stands in Dubai (Mercato Mall, Wafi Mall) and Abu Dhabi (The Galleria) and can be booked online at dnatatravel.com.” said Klaus. There are around 900 drinking water fountains in Vienna where parched visitors can quench their thirst. Overall, some 18 percent of Vienna’s arable land is accounted for by organic crops. Fruits and vegetables from Vienna’s organic farmers are available at the city’s markets. All these factors clubbed together project the reality that Vienna is truly a green destination with a lifestyle that is not only natural but also healthy in many ways. “In addition to this, from June beginning to end of August, visitors can also send flowers from Viennese parks online to their friends and relatives and, with a lucky draw in place, win a luxury weekend in Vienna for two,” he added. Vienna has recently been voted as the city with the best living quality in the world for the fifth year in a row, as per a study done by Swiss-based international consulting organization, Mercer. As per the Economist Intelligence Units (EIU) recent ‘Liveability ranking’ puts Vienna at the number 2 position on the globe.